Tajikistan’s economy is largely based on its substantial water resources, which are used for the irrigation of cotton, the country’s primary agricultural crop, and the production of aluminum, its principal industrial export. Two great river systems (the Amu/Panj and Syr Darya) dominate Tajikistan’s mountainous topography, giving it the world’s eighth-largest hydropower capacity. Both river systems are fed by snow and glaciers and end in the basin of the Aral Sea in neighboring Uzbekistan. The relatively limited amounts of flat land in Tajikistan are in the valleys associated with these river systems. This agricultural land is intensively cultivated, with 70% or more irrigated, and cotton production is mandated for all but the smallest farms, even for privately owned commercial farms (dekhan) that were established after 1997 as a result of the reforms of the Soviet-era state and collective farms. Despite its abundant water resources, Tajikistan has the lowest ratio of irrigated land to population in Central Asia, and is considered food-insecure. Tajikistan’s transition from a Soviet Republic to an independent nation was delayed by a violent civil war that raged from 1992 to 1997, with significant loss of life and property as well as internal displacement of populations. Since peace was negotiated in 1997, the country has experienced greater economic growth and, with the exception of cotton, the agricultural sector has regained pre-war levels of production. Tajikistan is still a poor country, with three-quarters of the population living on less than US $2.15 per day. Tajikistan has made some progress in privatization of rural land, especially in increasing the size of plots made available to households for food production. The agricultural productivity on these smallholder farms has driven the substantial rates of growth, with a lesser contribution from the privatized mid-size commercial farms (the dekhan, or ―peasant farms). The contribution of the still-extant state and collective farms has declined. Indebtedness of the dekhan has emerged as a major issue, though a 2010 government decree forgave most farmers’ cotton debt acquired prior to 2008. Recent moves to allow dekhan land certificates to be used as collateral for credit issued by state banks are introducing new uncertainties into the sector. Limited non-agricultural employment opportunities and low incomes in the agricultural sector in Tajikistan have contributed to a steady outflow of men to other countries (principally Russia) for work. Remittances are estimated to account for as much as 30% of Tajikistan’s GDP since 2000, although the economic downturn in 2008 saw this number increase sharply to 50% before dropping to 34% in 2009. Women in Tajikistan have assumed a greater role in the agricultural workforce but have, as a result of legal and political changes, lost property rights and protections that they had during the Soviet era. The civil war disrupted the education system in Tajikistan and it is now believed that the country’s youth are bringing fewer skills to the workplace. External interventions were critical to the negotiations that led to peace in Tajikistan, and external support has been important to the economic reform efforts that have been pursued since 1997. However, Tajikistan continues to have a record of high levels of corruption and illegal trade, involvement in trafficking of narcotics, and the persistence of rules appropriate to a state-led economy. Poor economic governance has slowed progress toward the development of an economy that is robust, diversified, and uses Tajikistan‘s unique natural resources profitably and sustainably. With 70% of the country’s population living in the rural areas, and the demonstrated success of smallholder private farmers in increasing production, outstanding issues on the privatized mid-size farms (dekhan) need to be addressed. These include technical issues regarding land and water management as well as policy issues regarding debt, production financing, choice of crop, and marketing. They also include the fact that many dekhan farms were formed from state/collective farms to meet a deadline for privatization in 2005, without really engaging the members in the process; operations continue as they were conducted in the Soviet era. Donor experiences with building Water User’s Associations (WUA) and other interventions intended to increase water productivity should provide information useful for further action, as extensive training and organization will be needed. Donor proposals that Tajikistan develop agricultural alternatives to cotton are likely to be politically sensitive, but recent crises and lack of profitability in the sector may encourage the government to explore new options with donor support. Current laws and regulations are inadequate for ensuring that Tajikistan’s land, water, pastureland, and forests are used efficiently and sustainably. Public-sector capacity to implement these laws and regulations also needs to be enhanced if compliance is to be monitored and enforced. Donors have provided considerable support to institutional development, including the operations of the khukumat and jamoat (district- and local-level executive authorities) and the Land Committees, but more needs to be done to increase effectiveness and accountability. Donors could also consider funding additional research on tenure security, resource management, and the impact that current provisions have had on investment, environmental sustainability, and market development. Some projects have helped agricultural workers to become aware of their rights and to claim access to land. Women’s rights, however, have not been fully recognized; this has become more of an issue as male out-migration for work has continued. Donors could expand assistance that enables potential smallholders or those interested in establishing larger farms to exercise their rights to land. Support could include a livelihoods component that would enable new landowners, especially in female-headed households, to make best use of their land, including provision of agricultural extension advice and marketing support. Tajikistan is a mountainous country with a primarily rural population dependent on livestock and small-scale agriculture. The snow and glaciers of the high mountains feed the country’s many rivers and streams and permit intensive, irrigated cultivation of farms established in the valleys. Two great river systems – the Amu/Panj and Syr Darya – dominate. Both are shared with neighboring countries and end in the Aral Sea basin in Uzbekistan. The rivers also provide significant hydropower for the operation of Tajikistan‘s aluminum industry. High-altitude plateaus provide seasonal grazing for herds of large and small animals. Tajikistan’s critical water resources are not, however, well used. While nearly 70% of the farmed land is irrigated, for example, the productivity of the water is relatively low. State mandates to produce cotton for export have not resulted in a globally competitive, diversified agricultural sector capable of paying good wages to agricultural workers. Water has been treated as a free input, and investments were not made to ensure its efficient, sustainable use. The irrigation infrastructure is now badly in need of rehabilitation and development if problems of salinity are to be managed. In general, land degradation, including deforestation, is a major environmental challenge facing the country. The dissolution of the Soviet Union in 1991 was followed by a devastating civil war (1992–1997). The war claimed over 50,000 lives, displaced approximately 1.2 million people, and led to economic collapse and food and fuel shortages. It effectively delayed legal and institutional reform in Tajikistan. Since the end of the war, the state has passed a series of laws, presidential decrees and regulations promoting private property and land reform, but land use and ownership continue to be restrictive. For example, until very recently the government has continued to mandate production of cotton on irrigated farmland, restricting the freedom of even the privately owned dekhans. The 1996 Land Code, as amended through 2008, provides every household with a right to enjoy a small household plot of land. Workers on large farms that were formerly state or collective farms generally exercised this right to produce food for their families and have, in the reform process, expanded these plots through applications for privatized land or through leasing. Workers on collective and state farms were also given the right to withdraw their ―share‖ of the collective/state farmland and establish their own independent farms. Relatively few households have realized this right, however; a combination of lack of knowledge within the population, high costs assessed for share withdrawal, and broad local government discretion over land rights has left many rural people working on large dekhan farms that continue to operate on state/collective farm principles. These workers generally receive very low wages. Tajikistan’s total land area is 140,000 square kilometers, of which less than 7% is arable. The country’s 2008 population was estimated at 7 million, with 74% classified as rural. 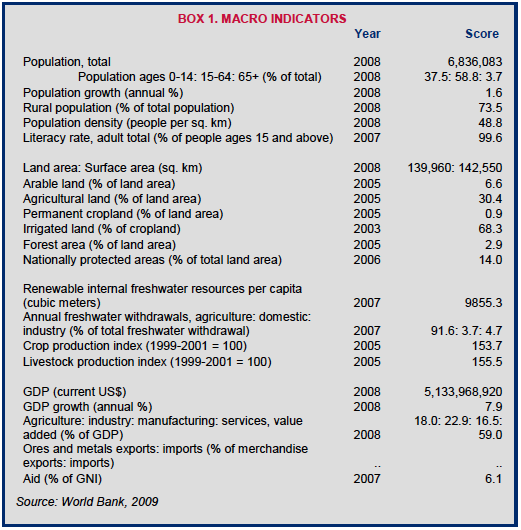 In 2008, the total GDP was US $5.1 billion, of which 18% was attributed to agriculture, 23% to industry, and 59% to services. The agricultural sector employs 60% of the country’s workers. As of 2003, Tajikistan had the highest rate of rural poverty in the European and Central Asian region, with 76% of the population living below US $2.15 per day. The country has the lowest GDP of the former Soviet republics (Lerman and Sedlik 2008; World Bank 2009a; World Bank 2008). Tajikistan is land-locked and mountainous; 93% of the country’s land area is covered by mountain ranges. The region is prone to landslides, avalanches, earthquakes, and mudflows. Roughly 30% (4.2 million hectares) of the country’s total land area is classified as agricultural, 81% (3.4 million hectares) of which is pastureland. Sixty-eight percent of the 1.26 million hectares of permanent cropland is irrigated. Primary agricultural products include cotton, grains, fruit, vegetables, cattle, sheep and goats. Tajikistan has the lowest ratio of irrigated land to population in Central Asia, and is considered food-insecure. Specially protected territories make up 14% of the land area. Roughly 3% of the land is forested with no reported rate of deforestation. Anecdotal information, however, indicates that deforestation may be significant, especially as smallholders seek to expand their agricultural acreage (Akhmadov 2008; UNDP 2009; World Bank 2008; ARD 2007; World Bank 2009a; Lerman and Sedlik 2008; Robinson et al. 2008; IWMI n.d.). The geographic conditions of Tajikistan, characterized by mountain ranges, uneven water resources, and scant forest coverage, have led to uneven population distribution. There are few people in the arid and high-altitude areas, leaving the majority of the rural population residing on the limited arable land, with a land availability of about 0.16 hectares per capita (ADB 2007a; Akhmadov 2008). In response to the difficult situations people encountered during the civil war, much of the population reverted to subsistence practices in the mid-1990s; these severely strained the fragile mountainous ecosystem. Steep hillsides were reclaimed for crops, nearby winter pastures were overgrazed, and forests were more heavily utilized for wood. Today, the majority of the country is threatened by mudflows and boulder-move risk zones, which are a result of the fragile soil structure in mountainous areas and poor vegetative cover, both in turn worsened by natural causes and human activity. Families who did not receive, in practice, individual land rights during the agricultural reform process are among those most likely to encroach on sloping rainfed pasturelands for subsistence farming (ADB 2000; World Bank 2008; Akhmadov 2008; UN 2004; Robinson et al. 2008). During the Soviet era, 99% of agricultural land was in the hands of large state or collective farms, and 1% of agricultural land was cultivated for household subsistence by families. The 1996 Land Code granted every household a permanent, heritable use right to a 0.15–0.40 hectare household plot. These household ―garden or ―kitchen plots had generally been granted to members of state and collective farms in the Soviet era. The government expanded distribution of these small plots in two phases, corresponding to Presidential Decrees in 1995, 1996 and 1997. It thus allocated a total of 75,000 additional hectares in plots that are commonly known as ―Presidential Lands, which were used primarily to bolster the size of garden plots that were under the national minimum size. Today, 5–6% of agricultural land is used as household plots. The remainder of the agricultural land is currently held in dekhan farms (controlling approximately 60% of this land), by the state (controlling approximately 25% of this land), and by various other agricultural entities and municipalities (controlling 4–5% of this land). The preceding breakdown, while not totaling 100% of agricultural land in the aggregate, is based on the best available estimates; data varies (Lerman and Sedlik 2008; World Bank 2008; Duncan 2000). The dekhan farms range in size from 10 to thousands of hectares. These farms are, in theory, run by private persons at individual, family or collective/associative levels. Many, however, remain large collective dekhan farms which have changed in name only from collective and state farms, and continue to operate as such (TAFF 2010; Robinson et al. 2008; Porteous 2005). Land from the redistribution of state and collective farms is divided into plots based on the amount of land and number of farm workers with rights to the land. These plots are the shares of the workers, who apply to the district Land Committee to withdraw their share. Workers can get a plot of land from the state or collective farm on which they worked, or they can acquire a separate plot of land based on the value of their share. Land is distributed through the Special Land Fund, which is made up of unused, devalued, or expropriated agricultural land, reserved land, deforested land suitable for agriculture, and other former state and collective farm land that has not been used in agricultural production. Dehkan farmers, part-time farmers, people using the land for household garden plots, and people with agricultural knowledge and qualifications receive priority in distribution. Land allocated by Presidential Decree is distributed according to family size and size of existing plots, with priority given to families with less land per capita. Individuals hold non-transferable use-rights to Presidential Decree household plots for a perpetual term. (ARD 2003; ADB 2005; Lerman and Sedlik 2008; Robinson et al. 2008; GOT 2008). Dehkan farms can be established upon application by individuals, families, or collectives. A family dehkan consists of two or more related families who produce and market jointly. A collective dehkan consists of two or more unrelated families, producing and marketing jointly. (Dekhan farm ―associations, or ―associative dekhan farms, operate in a similar manner to collective dekhans, although the families involved technically have their own dekhans and work together cooperatively.) Both family and collective dehkans operate by appointing a head who officially holds the farm’s land registration certificate and legally represents the interests of the farm (Duncan 2000; GOT 2008; ARD 2003; Robinson et al. 2009; GOT 2009a). Most dehkan farms are based on land allocated from the state. Many individuals choose to supplement their state-allocated household plot by leasing land. Leases for land must be for a period of at least one crop rotation. Foreign citizens and legal persons can be assigned land rights for up to 50 years (Lerman and Sedlik 2008; ARD 2003). Restructuring has occurred unevenly, with the level of reform determined by the level of interference by local government. All workers on farm enterprises (state or cooperatives) had an unconditional right to withdraw their land share and receive land in-kind to start their own dehkan farm, a process which the law required to be completed by 2005. The response to this ultimatum was often the superficial creation of a collective ―private farm (dekhan), operating within the same physical parameters as the collective or state farm from which it derived. Although members are legally allowed to withdraw their physical shares from these collective dekhans, this is an expensive process which few undertake. According to a 2004 study of four restructured collective dekhans, only about half of the families had received physical land shares, and some families that had previously rented had even lost land because they couldn’t pay for title documents to their share. The farm administration had charged members up to US $70 for these documents, which were supposed to cost US $2. Especially where agricultural land is more valuable (often corresponding with cotton production), farms have retained their collective or state nature, and individual farm members have in most cases not received a physical land share, although they may hold a paper share. These members continue to work as laborers on the farms, receiving extremely low wages – i.e., US $10 per year and/or a sack of wheat and/or cotton sticks for household fuel use – and are considered by observers to be landless. In addition, many men have emigrated to look for work, leaving women and girls to provide the bulk of agricultural labor. To date, those with the right political and family connections have been the largest beneficiaries of restructuring, whereas poorer and less connected families have received little, if any right to land (ARD 2005a; ADB 2005; World Bank 2007b; Robinson et al. 2008; Robinson et al. 2009; Porteous 2005). Women were sometimes excluded from receiving individual dekhan plots from the allocation of collective land because it was presumed that they lacked the labor power to cultivate their own land. Currently, many women are effectively excluded from the process of obtaining dehkan or household land-use rights because administrators are often dismissive of women’s farming capabilities and knowledge. As a result, women are more likely to hold lesser shares of the land that they work and are less likely to report tenure security. Female-headed households have less access to land, irrigation and livestock (ADB 2000; ARD 2005b). The 1994 Constitution and a large number of laws, Presidential decrees, administrative regulations and government resolutions govern land rights in Tajikistan. The Constitution states that land and natural resources are the property of the state, which is charged with their efficient management (GOT 1994). In 1992 Tajikistan began its land reform efforts by enacting the Law on Dekhan Farms and the Law on Land Reform. Together, these laws provided every citizen with the right to create a dekhan farm from collective and state farm land in the form of individual, inheritable land shares. Every member of a collective or state farm received the right to a property share. The laws also required that the land of collective and state farms be restructured into dekhan farms, lease-share enterprises, and agricultural cooperatives. The government superseded the 1992 Law on Dekhan Farms with the Laws on Dekhan Farms of 2002 and 2009. The newer laws explicitly recognized the de facto existence of collective dekhan farms in addition to the individual and family dekhan farms that were expressly created by the 1992 law, and set forth the right of land-share holders to convey their parcels to others and to use their land-shares as collateral. The 2009 law also introduced the explicit right of farmers to choose their own crops, and removed vague terms such as ―non-rational use from the list of reasons for which a land plot could be withdrawn by the state (Lerman and Sedlik 2008; GOT 2009a; Robinson 2008 et al. ; Duncan 2000). In 1995, the president issued two important decrees on land reform, to follow up on the earlier laws. Under Decree No. 342, fifty-thousand hectares of collective and state farm land were to be transferred to private household plots. This was followed by Decree No. 621 which essentially reiterated the provisions of the 1992 Law on Land Reform (Duncan 2000). The Land Code, adopted in 1996 and as amended, provides a framework for current land-related legislation in Tajikistan. The 1996 Land Code reaffirmed state ownership of land and makes provisions to secure the rational use and protection of land. Recent amendments to the Land Code clarified existing tenure types, explicitly set forth the right to convey, mortgage, and assign servitudes to land-shares, established expanded rules regarding compulsory acquisition of land, and clarified the allotment procedures for additional household plot land. Under the Land Code, pastureland is considered ―agricultural land and so is subject to the same laws as arable land. The 1999 Civil Code also governs certain matters related to land (ARD 2003; GOT 2008; Duncan 2000; Robinson et al. 2009). In 1997 an additional 25,000 hectares were allocated to household plots under Presidential Decree No. 874 (Duncan 2000). The 2002 Law on Specially Protected Territories shields areas from overexploitation, with different protection and use regimes (World Bank 2008). The 1994 Regulation on Procedure for Transfer of Land from One Category to Another and the 2002 Presidential Decree On Preservation and Rational Use of Irrigated Land prohibit decreasing the area of irrigated land and other highly productive land. The regulations also prohibit allocating plots of land for housing if the land could be an irrigated subsidiary plot. This framework sets a legal preference for use of land as irrigated farmland. However, 2008 amendments to the Land Code provide for conversion of agricultural land for constructing a house, and go so far as to include establishment or expansion of a city or settlement area among those reasons that justify compulsory acquisition of land for public use (ARD 2003; GOT 2008). Prior to Soviet rule, Islam and Shari’a law governed many aspects of social life. Traditional non-formal leaders still exist in Tajik communities, but they are significantly weaker than the local government (khukumat) in most areas. Shari’a has been revitalized throughout Tajikistan as local custom (Khaidarova 2003; ARD 2007). There is no private legal ownership of land in the country, as land and other natural resources are owned exclusively by the Republic of Tajikistan, which is responsible for their effective use. The Land Code sets forth several tenure options for agricultural land, distinguishing ―primary use rights from ―secondary use rights. Primary use rights include the following. Perpetual use. This right has no fixed term. It is granted to legal entities such as state and cooperative agricultural enterprises, public and religious organizations and charities, industrial and transportation needs, public enterprises, defense, joint ventures that include foreign entities. Limited or fixed-term use. This right may be granted to legal or physical persons for either a short-term (up to 3 years) or long-term (3–20 years). Life-long heritable tenure. This right may be assigned to physical persons or collectives. Physical persons must re-register the right in the case of inheritance. This right applies to land-shares used to organize a dekhan farm, as well as household (―garden) plots. The only secondary use-right established in the Land Code is the right to lease. According to the Code, primary rights holders may lease out their plots for a term not exceeding 20 years (GOT 2008). 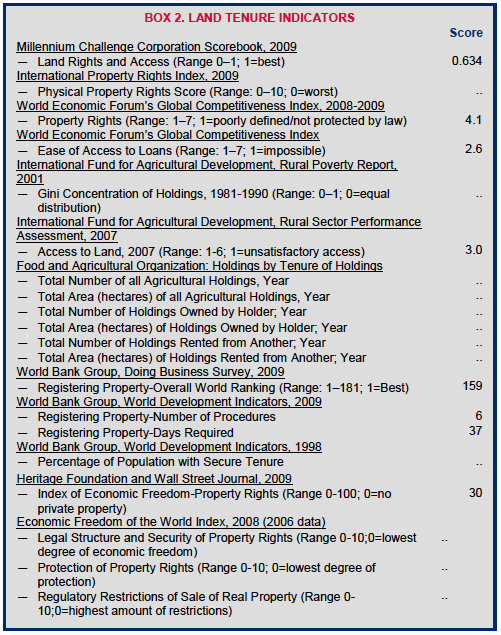 All use-rights are subject to state-imposed land-use standards, and use-rights may be terminated for a long list of reasons which include termination of activities by the land user, non-use for two years, use of the land contrary to the use established in the use-rights document, use that leads to deterioration of environmental conditions, and use that causes losses in soil fertility or pollution of the soil through chemical, radioactive or other means (GOT 2008). Household farms are primarily leased, with 67% of the land leased from farm enterprises and about 12% leased from other individuals. The remainder holds use-rights directly from the state (Lerman and Sedlik 2008). Land-use rights must be registered by the raion (district) Land Committee and khukumats. Rights of perpetual use, limited use and lifelong inheritance use must be recorded in a certificate, while leases must be registered in the Land Use Registry. Individuals must re-register land they inherit (GOT 2008; ARD 2003). On dekhan farms, two tiers of documents must be issued and registered. First, the Land Committee issues a Land Use Certificate to the farm manager or leader, describing the farm’s physical location and boundaries. Second, the Land Committee issues individual Land Use Sub-Certificates to all permanent workers on the farm. Land Use Sub-Certificates were introduced in 1998 and followed by a Government Resolution in 1999 to simplify procedures for registration of land-use rights. However, individuals must still petition their local khukumat to apply for and register a physical land-share, and the khukumats have a wide range of discretion in determining what land to distribute and to whom (ARD 2004; Lerman and Sedlik 2008; Robinson et al. 2008). However, laws governing land rights give wide discretionary powers to local government, and use-rights are often terminated without compensation. Upon recommendation of the Land Committee, local governments can confiscate land for a broad range of reasons, as discussed above. The process of termination requires the giving of a penalty and warning, after which the Land Committee can propose termination if the problem is not rectified. However, there has been no specific proof required, no time frame for the decision of the Land Committee, and no process for appealing the decision. 2008 amendments to the Land Code established some degree of additional procedure protection for land-rights holders, including review in court and notification of all affected rights holders. The extent to which these new provisions will alter local government practices is not yet known. Until recently, local governments also had the authority to transfer land from one private party to another. The party awarded land was obligated to pay compensation to the other, although there was no established process for determining the level of compensation, and an individual had no opportunity to contest such an action. Under 2008 amendments to the Land Code, however, local governments do not have authority to withdraw or terminate the use of a plot except per rules on compulsory acquisition (see below), implying that they may not withdraw use-rights from one farmer to transfer them to another. Whether local practice will follow legislative change is not yet clear (ARD 2003; ARD 2004; ADB 2005; GOT 2008; World Bank 2007a; ARD 2003). Inefficiency and potential corruption within government lead to land tenure insecurity. When land was transferred to household plots through Presidential Decree, records of these transactions were not properly maintained, and the amount of land allocated did not account for the full number of households. Thus, land-use rights for many of the household plots cannot be proven, some household plots failed to be distributed equitably, and most users consider their household plots to be too small (Duncan 2000; ARD 2004). Under the law, users of pastoral land may obtain secure rights to grazing land via dekhan farms or from former collective or state farm land that has been ceded back to the government. Individual and family dekhan farm holders are entitled to receive their share of pastoral land within the area of the former collective or state farm. However, until recently, pastoral land on collective dekhan farms was often treated as common-property land over which individuals did not have control. Recent pilot projects in some parts of the country have sought to individualize pastureland rights (Robinson et al. 2009). A lack of general knowledge regarding land-use rights is another major barrier to tenure security. For example, it is possible for workers to belong to a collective dehkan without realizing that the farm is no longer a collective or state farm. The dehkan certificate for land-use right is issued in the name of the dehkan head, as opposed to the names of each member. Additionally, when collective or state farms are transformed into collective dehkan, managers often continue to report to the khukumat instead of to dehkan members. For example, a 2003 study on land reform in Khatlon Province found that, out of 965 households that did not have dekhan farms, 92.2% did not know how to apply; an additional 4.5% knew how to apply but did not think they could afford the costs associated with land application, taxes and start-up costs, and 3.3% had applied but been refused (ADB 2005; ARD 2004; Porteous 2005). Under the 1994 Constitution, women have the same legal rights to use land as men. In practice, however, women often face discrimination in securing access to land. A woman who marries and moves off her farm loses her land-use rights, as she is required to live on or adjacent to the land to maintain those rights. Although the Land Code provides for women to inherit land-use rights, the Government of Tajikistan admits that the Code’s provisions are still at a very early stage of implementation, and inheritance rights are not maintained through the marriage or divorce of women (ADB 2000; ADB 2005; ADB 2007a). With the increase of single women due to out-migration and widowhood, the tradition of Tajik Muslim men taking a second wife has been revitalized. Although the practice is illegal, government officials often overlook it. Nongovernmental organizations have expressed concerned about the vulnerable position of second wives and their children, as they are not recognized within the legal framework, and thus have no land rights (ADB 2000). Under the Soviet system, women had high levels of political representation and participation in the workforce. With the collapse of the Soviet Union and the subsequent civil war, women suffered from the deterioration of the state social safety net and support they had previously enjoyed (ADB 2000). Information regarding women’s rights in pre-Soviet Tajikistan is scarce. Since independence from Soviet rule, there has been a revival of Islamic practices. However, women often do not know their rights under Islamic law (ADB 2000). Authority over land is shared between: (1) the National Land Administration and its district-level Land Committees; and (2) local and district-level governments (khukumats and jamoats). The Land Administration (or Land Committee) is the national body that develops regulatory legal acts on state control of land, registers land- use rights, establishes land tax systems and rate, and resolves land-use disputes. At the district level, Land Committees are charged with executing these authorities (ARD 2003; GOT 2008). Local governments’ authority over land issues often overlaps that of the Land Committees, creating confusion in areas such as land registration and control over land-use. For example, the Land Code lists ―conducting the state land cadastre and land monitoring under the jurisdiction of both the state Land Committees and the local governments. Local governments have the important function of allocating, withdrawing and regulating most land plots and individual small holdings, although the Land Code also designates to the Land Committee the authority to allocate land (ARD 2003; GOT 2008, Arts. 6–7). There is virtually no formal land-sales market in Tajikistan. The real ―market for land is the rental market. Leasing and/or renting land requires government approval through the Land Committee and the local khukumat. The land-leasing process is structured like a highly regulated purchase and sale market. The rental rates for land are centrally set, and for leased collectives are based on the average expected profits from the land. The process must be approved by the Land Committee and the local khukumat. Land can technically be mortgaged, although no record of mortgage transactions is currently available (ARD 2003; ARD 2004; GOT 2008). Until recently, the state had the power of compulsory acquisition for both public and private uses. The 2008 amendments to the Land Code set forth revised and expanded rules for compulsory acquisition of land, however, which limit the state’s acquisition power to ―exceptional cases, in the absence of other options about where to locate a structure. Public purposes include infrastructure, state buildings such as schools, and discovery of mineral deposits, as well as establishment and expansion of cities and settlements (GOT 2008, Art. 37). The 2008 amendments establish a number of procedural protections for compulsory acquisition of land, including that: (1) the landholder must be notified in writing at least one year prior to the anticipated acquisition; (2) the landholder has the right to go to court if in disagreement over acquisition, and may continue use of his or her land while the case is pending; (3) any development project put forth as a ―public purpose must demonstrate feasibility by presenting urban planning documents, technical and economic calculations, and other relevant draft project approvals; and (4) all acquisitions for public purposes must be published in the state-owned newspaper within five days of the acquisition (GOT 2008). According to the amended Land Code, compensation in the event of compulsory acquisition consists of allocation of a new plot of equal value, compensation for improvements to the land (such as housing) through construction of a structure of similar value on the replacement plot (or payment of cash), and payment for any other losses associated with the use of the land, including lost profits. Compensation for improvements and other losses shall be made according to market value. The Code states that those private individuals and entities standing to benefit from the acquisition shall provide relevant compensation to the original landholder (GOT 2008). Tajikistan’s formal courts have jurisdiction over claims relating to land leases. However, the majority of disputes relating to land-use rights are settled by the Land Committee, the national body responsible for administration of land. The Land Committee holds the power to legislate, enforce, and adjudicate land claims. If a party is not satisfied with the Land Committee’s decision, it may appeal to the formal courts (ARD 2003; GOT 2008). Along Tajikistan’s border with Kyrgyzstan, in the northern Sughd Province, conflicts over pastureland have escalated since 2003, when political tension between the two countries led to restricted border movement. Most Tajik households living in the border region have at least a few head of livestock, but they have no grazing land. Prior to 2003, these households had relatively free access to Kyrgyz pastureland, as the border was porous and not clearly defined. Violent outbreaks followed the border closing of 2003, as Tajik households were left with no option for grazing their livestock – a critical livelihood component for many of these households (Scalise 2010). Recognizing the high potential for escalating violence, both countries established conflict committees that helped to negotiate arrangements permitting the Tajik livestock owners to pay Kyrgyz shepherds and local governments to graze Tajik livestock on Kyrgyz land. The Tajik households must pay between four and six times the amount that Kyrgyz households pay to graze livestock and shepherds retain the value of milk and milk products. The arrangements are not formal, transparent or enforceable, fueling ongoing conflict. Underlying sources of continued tension include the unequal bargaining power between the Tajik livestock owners and the Kyrgyz shepherds and institutions, a lack of information on legal rights and a lack of transparency in decision-making, and the fact that parties have little recourse in the event that a problem arises. USAID is currently funding the Approach to Participatory Management of Natural Resources pilot project in the Fergana Valley, with the goal of developing an approach to conflict management in the borderland regions of Tajikistan and Kyrgyzstan (Scalise 2010). Tajikistan’s approach to land reform has been phased in gradually since the first legal acts on land reform were passed in 1992. Implementation began between 1995 and 1997 and continues to date. Some of the government’s land-reform processes are considered cosmetic, as about one-third of the 30,000 dehkan farms are collective and have perpetuated the collective/state model of organization. That agricultural productivity has not increased on collective dehkans has significantly reduced national growth. In addition, the government has maintained a substantial administrative role in farm decision-making, resulting in falling cotton production. According to at least some observers, however, Tajikistan’s overall land reform efforts have transformed the country’s agriculture landholding structure. The Soviet system of large-scale farm enterprises and tiny household plots has been replaced by a tripartite structure covering small (though enlarged) household plots, mid-sized dehkan farms and what remains of large corporate farms. The recovery of agricultural production to pre-transition levels as of 2006 and an increase in rural family incomes suggest some progress (World Bank 2008; Lerman and Sedlik 2008). The state continues to regulate cotton production. Despite laws and regulations providing for individual discretion in land use, the 2008 Law on Land Use Planning allows the state to intervene in cropping and production decisions on cotton farms. The state sets district production quotas for cotton, and the khukumats enforce cotton sowing targets in their districts. There are reports that students are forced to work on annual cotton harvesting campaigns, although officials maintain that the students do so voluntarily. In the 2009 Law on Dekhan Farms, the state explicitly codified the right of dekhan farmers to choose their own crops, which represented a change from previous versions of the law (Lerman and Sedlik 2008; ILRF and TSIYC 2007; GOT 2009a). Farm-sector indebtedness is among the most serious land-related issues facing the government. The inadequate reorganization of collective dehkan farms, together with continued government intervention in production decisions, especially in cotton-growing farms, has made it very difficult for the farmers to operate profitably. These farms have accrued enormous levels of debt fueled by banks’ continued willingness to lend even to uncreditworthy borrowers. The unsustainable result as of January 2006 was that total farm debt to both investors and noninvestor creditors was approximately the same as the total amount Tajikistan has received in loans and grants from the World Bank and the Asian Development Bank (ABD), since those institutions began operations in the country. Since 2003, the government has enacted several laws and decrees to address the debt problem. These measures include the 2003 Presidential decree No. 1054 (On the mechanism for settling the debts of reorganized agricultural enterprises and enterprises undergoing reorganization), and Government Resolution No. 542 (On settling the debt of reorganized agricultural enterprises and enterprises undergoing reorganization) , the 2005 Strategy for Cotton Farm Debt Resolution in Tajikistan, and the 2007 Government Resolution No. 111 (Plan of measures for cotton farm debt resolution in Tajikistan for 2007–2009). The general approach has been to institute freedom-to-farm measures and to create debt settlement-, restructuring- and repayment-mechanisms and timetables. These measures have been largely ineffective (Lerman and Sedlik 2008). The GOT’s 10-year (2006–2016) US $75 million National Planning Programme focuses on the need to enhance productivity and halt the degradation of land. The program includes: strengthening the enabling environment; developing more sustainable techniques for irrigating cropland; targeted research; and sustainable pastureland management. The program is funded by the GOT and donors, including a cofinancing of about US $ 14 million by the Global Environmental Facility (GEF) to complement investments made by the Program’s target beneficiaries. The program funding is expected to increase over time as more activities are added to the Program under specified eligibility, implementation, monitoring and evaluation rules (UNCCD 2005). The President of Tajikistan announced his intention to establish a market for the transfer of land-use certificates. In April 2009, he declared that the relevant ministries and departments should take the necessary steps to draft legislation to implement this goal and to promote reform of the agricultural sector. The Land Code as amended in 2008 and the 2009 Law on Dekhan Farms state that shareholders have the right to convey their shares to others, but neither law provides further details on transactions (GOT 2009b; GOT 2009a). In 2007, USAID spent US $4.7 million on economic growth in Tajikistan. In 2008 and 2009, USAID supported strengthening the Government of Tajikistan’s capacity to undertake further structural reforms, reduce regulatory barriers, and strengthen property rights. The USAID Land Tenure Reform project in Central Asia included technical and legal assistance to local authorities and farmers. USAID assistance to help farmers increase agricultural productivity has reached an estimated 5% of the nation’s farmers (USAID 2007; ARD 2005A; USAID 2010a). The ADB, World Bank and other major donors have been working to improve farm profitability and thereby address one of the underlying causes of the cotton-farm debt crisis. The ADB has focused on supporting infrastructure rehabilitation, agriculture and agro-processing, and education. A major World Bank project supported the privatization of 10 collective/state farms and oversaw the transfer of land-use certificates to family farmers. A larger World Bank loan will guide and support policy reforms to increase competition, promote foreign direct investment in ginneries, and de-link debt from investors (ADB 2000; ADB 2005; World Bank 2006; World Bank 2007a; World Bank 2005b). The World Bank is funding a five-year (2007–2011) US $16.7 million Community Agriculture and Watershed Management Project in Tajikistan. The project is designed to build the productive assets of rural communities in selected mountain watersheds, to increase sustainable productivity, and curtail the degradation of fragile lands and ecosystems. The global environmental objective is to protect significant mountain ecosystems by mainstreaming sustainable land-use and biodiversity conservation considerations within agricultural and associated rural investment decisions. In addition, the land resource management sub-component will foster sustainable uses of fragile lands and provide land-use certificates after three years of maintenance, subject to continued good land-use (World Bank 2004). In 2005, the World Bank approved a US $10 million grant to the Tajikistan Land Registration and Cadastre System for Sustainable Agriculture Project. The objective of the project is to expand farm privatization by distributing secure land-use rights certificates in a transparent and fair manner. As of April 2009, a total of 2488 land-use certificates had been issued under the project, and the pace of issuance was increasing after a slow start. The project aims to facilitate allocation of shares to both arable land and pastureland where relevant (for example in the Gorno-Badahkshan Autonomous Region). In addition, the project has provided training on land-use rights and the farmland restructuring process to more than 50,000 people. Arrangements are now in place for computerized production of land-use certificates. Some of the funding for this project will be used for high-resolution digital satellite imagery (World Bank 2005a; Devex 2010; World Bank 2009b; Robinson et al. 2009). ADB leads the Central Asian Countries Initiative for Land Management (CACILM) project, a 10-year (2006–2016), multi-country, multi-donor program promoting sustainable land management in Kazakhstan, Kyrgyzstan, Tajikistan, Turkmenistan and Uzbekistan. Several donors will spend a total of about US $1.4 billion. The initiative includes a project entitled Rural Development and Demonstrating Local Responses to Combating Land Degradation and Improving Sustainable Land Management in southwest Tajikistan that focuses primarily on sustainable management of irrigated arid lands (ADB 2007c). The United Nations Development Fund for Women (UNIFEM) and the Food and Agriculture Organization (FAO) collaborated on a pilot project that established 16 District Task Forces (DTFs) on land-related issues in three provinces. The task forces provide women with legal advice on land rights and offer classes on farm management and other skills. As of 2008, the DTFs served about 14,000 rural women and men. One result is that the proportion of farms registered to women rose from 2% in 2002 to 14% in 2008. District-level governments have adopted and are now funding the DTFs (UNIFEM 2010). Since the civil war, Tajikistan has seen a growth of national NGOs. At the local level, some NGOs provide legal aid. For example, Shahnoza, a local NGO, worked with USAID to establish a legal aid clinic on land-use rights. Overall, however, there is more evidence of international (as opposed to local) NGOs working with communities and female-headed households to claim their land-use rights (ADB 2000; ARD 2005a). Tajikistan has substantial freshwater resources, more than any other Central Asian country. The nation’s hydropower potential is enormous, the eighth-largest in the world with a technically feasible annual capacity to produce over 500 billion kilowatt hours. Precipitation, melting glaciers, and snowfields deposit 50.9 billion cubic meters of water in the country annually. There are 1300 natural lakes, covering a total area of 705 square kilometers and holding 46.3 cubic kilometers of water, of which 20 cubic kilometers are freshwater. Tajikistan also has nine reservoirs covering a total surface area of 664 square kilometers and holding 15.3 cubic kilometers. The largest of these are the Nurek and Kairakkum. Several major rivers flow through the country, including the Syr Darya and the Amu Darya with its tributaries the Vakhsh, the Pyandzh, and the Kafirigan. The country has potential groundwater reserves of 6.9 cubic kilometers per year, although actual exploitation is lower, reaching 2.5 cubic kilometers per year (ADB 2007a; ICG 2002; Lerman and Sedlik 2008; OIC 2008; GOT 2010; Encyclopedia of Earth 2008). Tajikistan constructed an extensive system of irrigation and drainage facilities during the 1950s and 1960s. In 2009 the World Bank reported that nearly 70% of cropland was irrigated; the Government of Tajikistan estimates that 88% of arable land (815,000 hectares – a greater total area than cropland) is irrigated. However, much of the irrigation system is either completely derelict or in urgent need of repair. The overall delivery efficiency of irrigation systems in Tajikistan is low, with losses from evaporation, seepage, general system deterioration, and unauthorized abstraction. As a result, only an estimated 630,000 hectares are still even partially irrigated. Increased soil salinity and waterlogging are common problems. Although Water Use Associations are being formed, the centralized design and management of the irrigation systems continue to lead to inefficient operation (ADB 2007a; ADB 2007b; World Bank 2005a; PA Consortium Group 2004; USAID 2004; IFPRI 2000; World Bank 2009a). In 2005, 59% of the population had access to an improved potable water source, with a much higher percentage in urban areas than rural. In rural areas, many households rely on water from rivers, lakes, ponds, and springs. Morbidity due to unsafe drinking water contributes to the cycle of poverty in rural areas (World Bank 2008; ADB 2000; ADB 2007b). Hydropower generated 98% of the country’s electricity in 1994 and continues to be a significant power source. An estimated 90% of the current power-generating capacity in Tajikistan is hydroelectric, and this power can be produced at only US $.004 per kilowatt hour, which is low compared to production costs of other energy resources. However, many Tajik households lack access to electricity in the winter months (October to May), when water used to generate hydroelectricity often freezes. During these months, rural households receive at most four to five hours of electricity per day, and on some days receive none. This causes a dependence on wood fires and kerosene, which results in respiratory disease and environmental degradation. The Tajik Aluminum plant, the largest in central Asia, alone consumes 40% of the nation’s electrical power (FAO 1997; World Bank 2008; ADB 2008a; Asia Times Online 2010; GOT 2010). Water for hydroelectricity is a source of considerable tension between Tajikistan and its neighbors. The Soviet irrigation networks carried water across national boundaries and depended on fuel and water transfer agreements between neighboring countries. In the absence of effective bilateral and multilateral agreements over the past two decades, cross-border tension over water has increased. When Tajikistan’s water freezes in the winter months, the country must rely on imported electricity from Uzbekistan and Turkmenistan, but shortages in these countries have restricted the supply available for export to Tajikistan. If Tajikistan uses its (nonfrozen) water reserves extensively to produce electricity during the winter, the water reserves are not sufficiently replenished to supply its neighbors’ summer irrigation needs. Past fuel transfer agreements supplied Tajikistan’s winter fuel needs, but these have been broken or neglected (World Bank 2005a; World Bank 2008; ADB 2008a). Tajikistan is in dispute with Uzbekistan over management of the Amu Darya. The GOT plans to build a hydropower dam (the Rogun) that would give Tajikistan almost complete control over the river (see below, Government Reforms, Interventions and Investments). This has increased tension with Uzbekistan, whose water security would be challenged by such a development (ICG 2002; Asia Times Online 2010). Tajikistan’s water resources are under threat due to the geography of the country as well as use-decisions. Irrigated areas are subject to substantial erosion, landslides and deforestation, which cause waterlogging and increased soil salinity. Water pollution is increasing with industrial production. The growing reality of climate change poses a serious threat, as rising temperatures lead to increased glacier-melt that could be disastrous to the country’s water supply and hydropower potential (FAO 1997; World Bank 2008). The Constitution of Tajikistan gives exclusive ownership of water to the state. Tajikistan’s 2000 Water Code governs water management, permitting, dispute resolution, and usage planning (ADB 2007a; ARD 2003; World Bank 2008). The state does not charge for general use of water, and for many years did not charge for irrigation. In recent years, however, the state has begun charging for water supplied through its water supply system. Household consumers who are connected to the water delivery system pay for water supply services. Because there are no meters, fees are estimated based on the number of people living in each dwelling unit and the estimated per capita consumption. In rural areas, many people pay to have drinking water delivered by truck because they are not served by the national water delivery system (ADB 2007a; World Bank 2008). The government restricts the quantity of water that businesses can use and the amount of pollutants that they can discharge into the water. The state can place quota restrictions on the quantity of water used by individual business entities. Enforcement is hampered by inadequate infrastructure for monitoring and enforcement (World Bank 2008). Water-use rights can be limited in the interest of the government or in the interest of other water users in the event of “excessive shallowness, emergency situations at water bodies, danger of epidemic” and other reasons. Water use is fully or partially stopped if payment for use has not been made. Primary water users, defined as those who have been given “water bodies for individual use,” can coordinate with state agencies to limit the rights of secondary water users (GOT 2000). The Ministry of Water Resources is responsible for water resources research, planning, development and distribution. The minstry is charged with construction, operation and maintenance of irrigation and drainage canals between and among farms. Further responsibilities include: controlling water use and quality; distributing water to central farm access points; planning measures for maintenance and improvement of the soil; and assisting Water User Associations (see below) with implementing technology. The Ministry of Water Resources has provincial and district offices (GOT 2010). The Ministry of Energy and Industry manages water supplies for electric power generation. Water resources are managed jointly by the state and local governments, which fix quotas for intake of water and collect charges (World Bank 2008). The Ministry of Agriculture is accountable for developing land-reclamation programs at the farm level, and for operating and maintaining irrigation networks at the farm level (GOT 2010). The state enterprise Tajikilkomkhoz holds responsibility for the domestic water supply and treatment of wastewater, and the Ministry of Environment is charged with protection of water resources (GOT 2010). Water User Associations (WUAs), the first of which appear to have been created between 1999 and 2004, are empowered to operate and maintain on-farm irrigation systems. WUAs are private associations, not run by the government. They are being established throughout Tajikistan at the instigation and with the support of international donor projects, international NGOs and the Ministry of Water Resources and Land Reclamation (MWRLR). The MWRLR has also established a Water User’s Association Support Unit (WUASU) to provide support to the WUAs (World Bank 2006; ADB 2007a). Fees for irrigation services were first introduced in 1996. From 2001 to 2005, the cost of water tripled; however, tariff rates are still too low to cover the operating and maintenance costs of irrigation systems. Through agreements with the World Bank, Tajikistan is committed to eventually fully finance operation and maintenance costs with user fees (World Bank 2005a; ADB 2007b; World Bank 2008). The Government of Tajikistan is attempting to increase its hydroelectric capacity with three major new dams. One of these, Sangtuda-I, was funded by Russia and began operations in 2009. Another, Sangtuda-2, was funded by Iranian investment, and is not yet complete. A final project, the Rogun Dam, is still in the planning stages. The Tajik government has prioritized the Rogun Dam as a ―national project and is trying to raise funds domestically through bonds, although this effort has not proved successful to date (the project lost funding from a Russian Aluminum producer in 2007) (Asia Times Online 2010). Tajikistan has initiated two water-related actions at the United Nations General Assembly over the past seven years. It first initiated the Proclamation of 2003 as the International Year of Fresh Water, and then the Declaration of 2005–2015 as the International Decade for Action: Water for Life. Tajikistan has hosted several international forums on water, on topics such as: Fresh Water (2003); Regional Cooperation in Transboundary River Basins (2005); and Water-related Disaster Reduction (2008) (GOT 2010). Since 2000, USAID has been working in Central Asia to improve the integrated management of natural resources. The USAID Special Initiatives Water Project focuses on providing governments with technical assistance and commodity support to improve management of critical water resources. USAID has succeeded in helping the government reorganize its management of river basin resources on hydrographic units rather than political subdivisions. USAID has provided technical assistance and equipment to rehabilitate pump stations and infrastructure and to improve communication systems. The agency provides ongoing support for the creation of water user’s associations, including a Water User Association support program implemented by Winrock International, and management of irrigation networks (PA Consortium Group 2004; USAID 2004; USAID 2010b). The World Bank, ADB, USAID and other major donors support the rehabilitation of irrigation systems, the establishment of WUAs, the creation of the WUASU, and policy reforms to promote private-sector development (World Bank 2008; ADB 2008b; ADB 2008b; USAID 2010b). Approximately 410,000 hectares of Tajikistan is forested, constituting 3% of total land area. Most stands of forests are sparse and fragmented. Large-scale forest planting began on collective/state farms in 1947; 38,000 hectares of forest have been planted in recent years. The majority of forest land administered by the state is set aside for grazing, even though grazing threatens forest resources (see below) (Akhmadov 2008). Despite covering only a small percentage of land area, forests are recognized as extremely important in regulating moisture and climate, protecting soil, and providing non-timber resources and limited timber. In the 1950s, hundreds of thousands of hectares of forest were cleared for the cultivation of cotton, reducing the forested area of Tajikistan to one-quarter of its former size. Recognizing the anti-erosion and anti-landslide functions of forests, the state prohibits logging in many areas (Akhmadov 2008). After the centralized Soviet energy supply collapsed, forests became one of the primary sources of fuel (together with cotton sticks) and the main source of construction materials in the mountains. While the total percentage of forested land did not dramatically decrease, the density of forests declined. As of 2000, wood continued to be the primary source of fuel for cooking (43% of households) and heat (45% of households) (Akhmadov 2008; ADB 2000; Porteous 2005). Land degradation, including deforestation, is a major environmental challenge facing the country. Tajikistan’s forests are pressured by cattle-grazing, farming, and uncontrolled logging for domestic needs. Each year, forestry authorities receive 500–600 reports of violations of logging regulations, and the infrastructure for enforcement is inadequate (Akhmadov 2008; ADB 2007a; World Bank 2008). The Constitution vests exclusive ownership of natural resources, including forests, in the state, which guarantees their effective use in the interests of the people. The Land Code defines national forest reserve lands as those – covered with forests or otherwise – allotted to the needs of forestry. The Land Code further states that boundaries of the forest reserve lands must be physically marked. The 1993 Forest Code is aimed at preserving forest resources and ensuring the protection and sound use of forest resources. The 1999 New Forest Code strengthened the legal protection of forests and provided for expanding nature-protection reserves (GOT 1994, Art. 13; Akhmadov 2008; FAO 2005;GOT 2008 ). All state forests in Tajikistan are classified as Category 1, which identifies them as having high environmental, economic and social value. Logging is prohibited except for forest maintenance and improvement (Akhmadov 2008; FAO 2005). Limited logging is permitted on small privately owned tree plantations, with timber sold on local markets, primarily for construction. Private individuals must submit documentation to state and local authorities indicating the source of marketed timber. The government sets statutory prices for standing timber. However, standing timber from communal forests is released free of charge for local communities, and standing timber from state forests is sold to individuals at a reduced price to ensure adequate access to fuelwood (Akhmadov 2008). The Ministry of Agriculture and Nature Protection houses the Department of Nature Use and Protection, which includes the Agency on Forestry and Hunting. The State Control Service of Natural Resources and Environmental Protection under the Department of Nature Use and Protection is charged with environmental protection responsibilities at the national level. The Tajik Scientific Research Institute of Nature Use and Forestry also has forest management responsibilities (World Bank 2008). Tajikistan’s 10-year (2006–2016) National Programming Framework includes components for sustainable forest and woodlands management, targeted research, integrated resource management, and protected-area management and biodiversity conservation. The Government of Tajikistan has increased the amount of Special Protected Lands and established a forestry faculty at the Tajik Agricultural University. However, forestry has not drawn significant resources from the state budget, and many regulations have not been implemented (UNCCD 2005; Akhmadov 2008). CARE Tajikistan’s Protected Areas and Biodiversity Management in the Gissar Mountains Project is designed to improve conservation of globally significant biodiversity in Tajikistan. To this end, the project seeks to demonstrate new mechanisms and approaches to effective management of three protected areas and their biological diversity. The project is designed to provide awareness-building to 101,000 individuals and improve quality of life of selected communities located next to the protected areas. Project components include providing technical assistance to relevant government agencies and financial support to the three areas and selected communities (CARE 2010). The German Agency for Technical Cooperation (GTZ) has been supporting a three-year (2008–2010) Sustainable Management of Resources in Gorno-Badakhshan project, implemented through the State Land Use Committee of Gorno-Badakhshan and the State Forestry Authority of Gorno-Badakhshan. The project introduced a community-based forest management system to reduce the illegal harvesting of timber for fuel. The local, formerly illegal users receive long-term property and usage rights based on lease contracts and management plans that have been developed with their own participation (GTZ 2008). 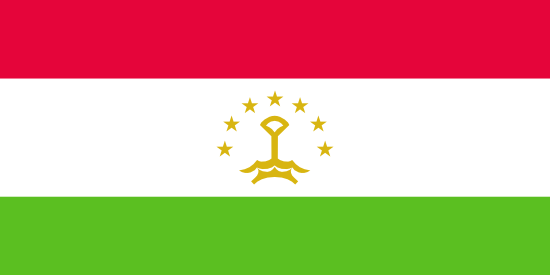 Tajikistan’s mineral resources include gold, antimony, silver and uranium. The mining industry was developed in close relation to the Soviet supply and trade networks. Tajik Aluminum (TaAZ) operates one of the largest aluminum-smelters in Central Asia; the company continues to import all of its inputs (other than power) and export the majority of its production. Most alumina is imported from Azerbaijan, Kazakhstan and Ukraine (ADB 2000; Levine 1998; Global Tenders 2010; World Bank 2008). As of 2005, only a few mining production enterprises were in operation. These include salt, antimony-mercury, and silver mining. There is potential for growth in the mining sector, as more than 400 mineral deposits have been discovered and explored, including zinc, lead, bismuth, molybdenum, tungsten, gold, silver, antimony, mercury and fluorite, as well as gas and petroleum. The north of Tajikistan has deposits of construction and decorative materials such as marble, granite, and limestone. Some 40 kinds of mineral raw materials are being extracted, such as fossil minerals (about 10), ores and non-metallic resources (about 90). Tajikistan has an estimated 4 billion tons of coal reserves, the largest coal reserves in Central Asia (GOT 2009c; USGS 2005). Under the Constitution, mineral resources belong exclusively to the state. The Law on Natural Resources requires payments for geological prospecting and mining of mineral resources. The 1994 Law on Mineral Resources establishes procedures for land-use during mining and mechanisms of land rehabilitation after extraction of minerals (World Bank 2008). Mining and use of mineral resources require formal licenses. The state issues licenses for oil, natural gases, metallic ores and precious stones, while khukumats issue licenses for sand, clay, gravel and other less valuable mineral resources. The license fees are calculated based on a percentage of the value of the mined mineral and depend on the type of mineral. If a state agency removes immovables or other natural resources from the land, the holder of the land-use rights must be compensated for losses. Fees collected are divided equally between state and local government entities (World Bank 2008). Tajikistan’s 1997 Law on Concessions regulates agreements between Tajikistan and foreign investors for the use of land and natural resources, but it does not address potential conflicts with existing land users for mineral, water or substrate rights. That local governments have the power to enter into these concession agreements prevents the establishment and implementation of a centrally managed plan and adds to the insecurity of land use rights (ARD 2003). Mining sites generate 77% of industrial wastes – more than 200 million tons a year. Hazardous wastes are not generally treated separately from other waste (World Bank 2008). The Ministry of Mines oversees the mining sector in Tajikistan. The Ministry of Agriculture and Nature Protection regulates the environmental impacts of mining (World Bank 2008). Tajikistan consumes significant quantities of oil, natural gas and coal, and is dependent on Uzbekistan, Kazakhstan, and Turkmenistan to meet its energy needs. The government has identified several gas fields for development, is seeking foreign investors, and has held talks with Iran for assistance in the oil sector. The government has also stated that it would like foreign investment in the hydroelectric sector. However, private investors seem reluctant to invest in the face of an unfavorable investment climate featuring non-transparent practices, unnecessary costs and unreasonable competitive barriers (GOT 2009c; USDOS 2009). The United Nations Development Programme’s project in Tajikistan (2010–2015) includes attention to sustainable natural resources management, improved environmental protection, and increased access to alternative renewable energy. UNDP will: assist the Government of Tajikistan with capacity-building support to negotiate, ratify and implement major international conventions, transnational policy, and legal frameworks on sustainable natural resources management; and work to establish favorable policy and legal frameworks, and an appropriate environment for business development to promote and broadly implement efficient, cost-effective and sustainable alternative and renewable energy technologies (UNDP 2009).